Oh what a year it has been! As Staff Council approaches a new cycle I wanted to take a moment to reflect on the accomplishments of the 2017-2018 year. The beginning of any academic year is full of excitement, wonder, and change. 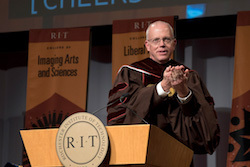 This academic year at RIT started with an additional change as a new “Top Tiger” took the helm, Dr. David Munson. I realized that the start to this chapter in Dr. Munson’s career is not so different from the new journey our incoming students embarked upon in August. Here are some pieces of advice* I have collected that are meant for new students but I think resonates well as Dr. Munson starts his new role.